U.S. President Donald Trump came to office clearly determined to reverse his predecessor’s policy toward North Korea, one that he saw as stagnant and ineffective. “The era of strategic patience is over,” Trump declared in 2017. Other Republican voices echoed this promise to chart a new path. When Trump’s first approach, rooted in threats and bellicosity, offered little reason for optimism, the president shifted to diplomatic engagement. What harm, many asked, could come from negotiations? “I don’t believe this is a situation where the president has anything to lose,” explained former Homeland Security Adviser Tom Bossert. In most cases, such confidence would be justified. What harm could possibly come from diplomatic engagement? North Korea, however, is not most cases, and the harm to American interests that appears to be emerging as a direct result of the Singapore talks may prove to be quite significant indeed. Over the past few months, the American position on the Korean Peninsula has declined in three significant ways that stem directly from Singapore. First, the meetings themselves and the accompanying media coverage gave North Korea a tool to reshape world opinion and drive a wedge into the alliance against it. 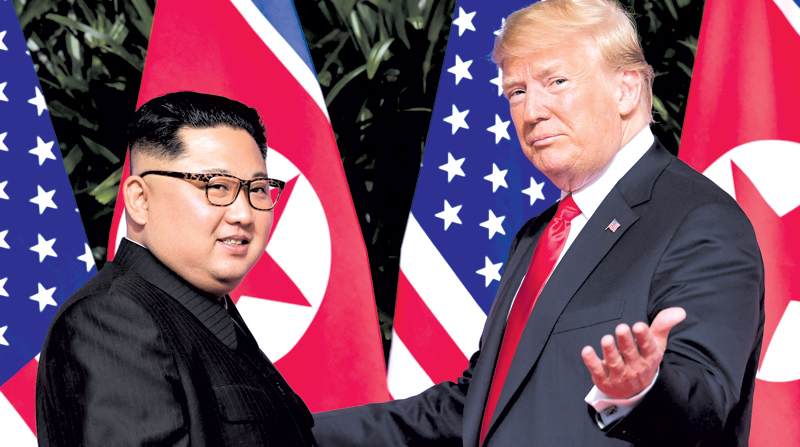 Trump’s decision to engage with this aberrant regime in a traditional head of state format, especially in conjunction with the North’s charm offensive during the Winter Olympic games, helped transmit to the world an image of North Korea as a conventional state, one that might be worth doing business with after all. Shortly after Singapore, public opinion of Kim Jong Un, a mass-murdering tyrant who oversees arguably the worst system of prison camps since World War II, improved dramatically, making it much more difficult to rally the world for action against him, especially as the United States’ own image as world leader plummets. Consider the U.S.-led sanctions efforts against North Korea. Trump deserves credit for implementing a strict regime when he came to power, but his own policies have now undermined them by normalizing the target. Can anyone imagine China, which was hinting at ending sanctions before the ink was dry on the Singapore agreement and is now engaged in an emerging trade war with the United States, cooperating in future efforts? What leverage does the United States have over Russia, whose own interests and recent history will likely drive it to continue developing trade relations with North Korea? Even U.S. allies like Canada and the EU states are moving away from the U.S.-led alliance system that dominated the world for much of the last half-century, and are creating their own trade networks and connections that will further diminish American influence. Putting together a large diplomatic coalition is difficult under even the most ideal circumstances; by normalizing North Korea at the same time that Trump was alienating many U.S. partners, the administration has essentially made a difficult task almost impossible. Second, the potential failure of the diplomatic path is troubling because of the likelihood that it will empower the more hawkish elements within Trump’s foreign policy circles. Most notable here is National Security Advisor John Bolton, whose desire for action against North Korea is well chronicled. “Given the gaps in U.S. intelligence about North Korea, we should not wait until the very last minute,” Bolton wrote in the Wall Street Journal shortly before he assumed office. “It is perfectly legitimate for the United States to respond to the current ‘necessity’ posed by North Korea’s nuclear weapons by striking first.” Less bellicose but still troubling statements have come from other administration hawks, including newly appointed South Korean Ambassador Harry Harris, and former National Security Advisor H.R. McMaster. Other steps — including the leaked “bloody nose” strategy and the withdrawal of the nomination of Victor Cha as ambassador because of allegations that he might oppose military action — have also sent the message that more aggressive options may be under serious consideration if diplomacy fails. Military action in Korea may indeed be necessary at some point. But the incredibly disastrous consequences that would likely follow a U.S. first strike means that such a path should only be explored under the most dire circumstances and in the context of a clear and present danger to the United States. A diplomatic effort that fails (as now appears likely) might just provide extra resonance to those potentially calamitous calls for action from the hawks, especially for a politically unpopular president with a tendency to personalize foreign policy and a need to rally a political base. Arguably the biggest ramification for the United States, however, appears to be in its relations with Seoul. South Korea has been one of Washington’s best allies since its official creation in 1948, and it stands today as a bulwark of U.S. influence in East Asia. Trump’s election, however, has thrown this relationship into disarray. The president attacked South Korea on the campaign trail for exploiting its relationship with the United States, castigating them (inaccurately) for providing “practically nothing” to the costs of U.S. troops stationed there. Subsequent actions, ranging from delaying the appointment of an ambassador to demanding the renegotiation of the Korea-U.S. Free Trade Agreement and an increased South Korean payment for the Terminal High Altitude Area Defense missile system, to overlooking many of the basic diplomatic courtesies that traditionally cemented the alliance, contributed to the weakening of this traditional relationship.